Flight to Bhutan is one of the most spectacular in entire Himalayas. Whether flying along the Himalayan range from Kathmandu or over the foothills from Kolkata, each flight is a mesmerizing aeronautical feat and offers an exciting descent into the Kingdom. On arrival at Paro airport, immigration and custom formalities and then received by Bhutan Mindful Travels' representative and transfer to the hotel. Evening take a stroll around town’s main street. Overnight at the hotel in Paro. After breakfast, visit to Ta Dzong (National Museum) and then walk down the trail to visit Rinpung Dzong which has a long and fascinating history. Afternoon visit to Drukgyel Dzong, the ruined fortress from where Bhutanese repelled several invasion by Tibetan armies. Then visit a traditional farm house which offers good insight into lifestyle of local people. In the evening, visit Kichu Lhakhang, one of the oldest and most sacred shrines of the Kingdom. Overnight at the hotel in Paro. After breakfast proceed to Thimphu, the modern capital town of Bhutan. Enroute stop at Chuzom (confluence) where Paro river joins Thimphu river. Nearby Thimphu, visit to Simtokha Dzong, the oldest fortress of the Kingdom built in 1627. It now houses the School for Buddhist studies. Afternoon, in Thimphu, visit to King’s Memorial Chhorten and Trashichhodzong, the beautiful medieval fortress/monastery. Then, visit Handicrafts Emporium & Textile and Folk Heritage Museum. Overnight at the hotel in Thimphu. Morning, Thimphu sightseeing, visiting National Library, Painting School and Traditional Medicine Institute. After lunch, drive to Punakha, the old capital town of Bhutan. Stop enroute at Dochula pass (3,050m) that heralds the most enchanting views of Bhutan. On arrival, check into the hotel. Evening visit Punakha Dzong, the fortress of 17th century and followed by visit to Khamsm Yulley Namgyal Chhorten. Overnight at the hotel in Punakha. After breakfast drive to Gangtey via Wangduephodrang. Visit magnificent Wangdue Dzong and town’s local market. Further ahead pass through dense forests and oak, rhododendron tress, reaching at Gangtey (Phobjikha). 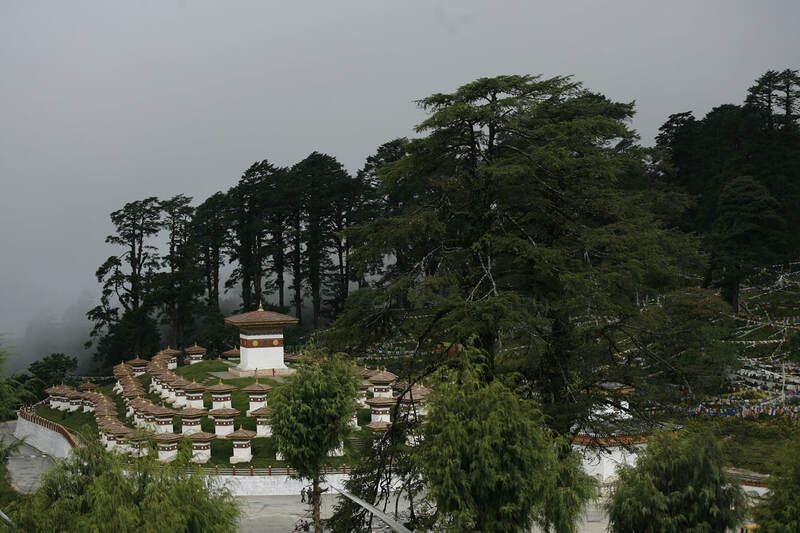 Evening take a walk around Gangtey village and visit Gangtey Gompa, the only Nyingmapa monastery in this region. Overnight at Camp / Guest House. Morning explore Phobjikha valley which is famous for Black Necked Cranes. These cranes migrate here from Central Asiatic plateau to escape the harsh winters. After lunch drive to Trongsa crossing 3,300m high Pele la pass. Evening visit to Trongsa market. Overnight at the lodge in Trongsa. Morning visit to Trongsa Dzong, the master piece of Bhutanese architecture and see Ta Dzong, the watch tower, built to defend this Dzong and surrounding region. After lunch, proceed to Bumthang, the religious heartland of the nation. Evening at leisure. Dinner and overnight at the lodge in Bumthang. Bumthang is the general name given to combination of four valleys – Chumey, Choekhor, Tang and Ura with altitude varying from 2,600m to 4,000m. It is home to many of prominent Buddhist temples and monasteries. Visit to Tamshing Lhakhang, the treasure house of interesting religious Buddhist paintings. Then visit, Jakar Dzong, the administrative centre of the valley. Afternoon visit Kurje Lhakhang, one of the most sacred places. Later visit Jambay Lhakhang, the ancient monastery dating from the introduction of Buddhism in the country. Evening visit to local market. Overnight at the lodge in Bumthang. The journey continues eastwards winding through more rugged terrain. The drive with spectacular views will take about 7 hours. Pass through Ura village in Bumthang before climbing sharply to the highest motorable pass in the Kingdom, the Thrumshingla pass (4,000 m). Gradually drop down to Sengor, watching cascading water falls on the way. The descent stops at 700m, on a bridge over the Kurichu. Ascent again through pine forest, maize fields and eastern hamlets to Mongar town. Visit Mongar Dzong, built albeit quite recently, the dzong still maintains the architectural traditions of old dzongs. Overnight at the lodge in Mongar. This trip of about 96 km takes 3 hours passing through Kori la pass (2,450m), the place marked by a pretty chhorten and a stone wall. The first part of the journey is through leafy forest filled with ferns. Later road descends rapidly through corn fields and banana groves arriving the famous ziazags of Yadi, which is a recent settlement. After that follows the Gamri river until the bifurcation to Dametsi, this temple perched on top of steep hill was founded by Choeden Zangmp and is the most important monastery of eastern Bhutan. This is the place from where famous Naga Chham, mask dance with drums originated. About 30 km onwards lies Trashigang at 1000m. Trashigang is the centre of the biggest and most populated district in the country. Visit Trashigang Dzong, standing at the extreme end of the spur, overhanging the Gamri river. It serves as the administrative seat for the district and part of the Dzong is occupied by the Drukpa monastic community. Overnight at the lodge in Trashigang. 24 km from Trashigang, visit the temple of Gom Kora, set on a small alluvial plateau, overlooking the river. Gom Kora is a famous place where Guru Rinpoche subdued a demon. Further ahead reach to Doksum village where you can see women busy in weaving traditional Bhutanese fabric and a chain bridge dating of the 15th century. Visit to Trashiyangtse Dzong, situated at the altitude of 1,850m. In former times Trashiyangtse was important centre because it lies on one of the carven routes leading from western and centre Bhutan. The Dzong is new and near by are the Art School and the famous Chhorten Kora. Evening return to Trashigang. Overnight at the lodge in Trashigang. After breakfast drive back to Bumthang with lunch enroute. Overnight at the lodge in Bumthang. Morning after visiting Bumthang market, drive to Punakha . Lunch would be served enroute at one of the famous restaurant in Trongsa town. Enroute at Wangduephodrang take a short break for tea / coffee and then proceed to Punakha hotel for overnight stay. Arrive Thimphu and check into the hotel. Dinner and overnight at the hotel in Thimphu. Morning free time in Punakha. After lunch drive to Paro for overnight stay.